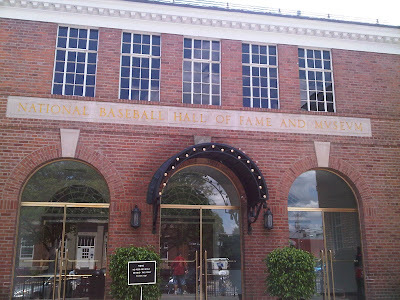 On the Friday that started July 4 weekend this year I took a trip to Cooperstown to visit the venerable National Baseball Hall of Fame and Museum. I traveled with one of my advisors, and noted beer aficionado, Tom Teatro. In addition to the Hall, we toured the excellent Ommegang Brewery, taking not one, but two tasting tours. And drinking several other of their fine Belgian-inspired beers at the bar on premises. But as good as the Ommegang visit was, we were really there to see the Hall of Fame; as always, it did not disappoint. A few photos follow. One of the things we wanted to accomplish over the weekend was to play catch on Doubleday Field. 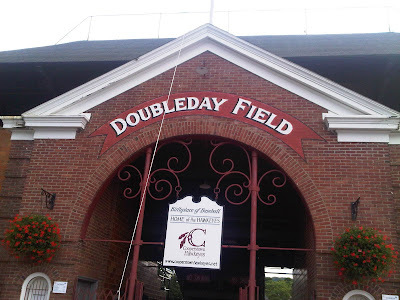 We gave it our best shot - eventually making it onto the field and throwing the ball back and forth for a few minutes - but then the Assistant Groundskeeper threatened to call the Cooperstown PD if we didn't exit the premises immediately. He even whipped out a walkie-talkie and pretended to radio the cops, a move he's no doubt honed by booting legions of teenagers ... and anyone who just spent the day drinking at Ommegang. Before we "trespassed" onto the field, we caught the end of this game. 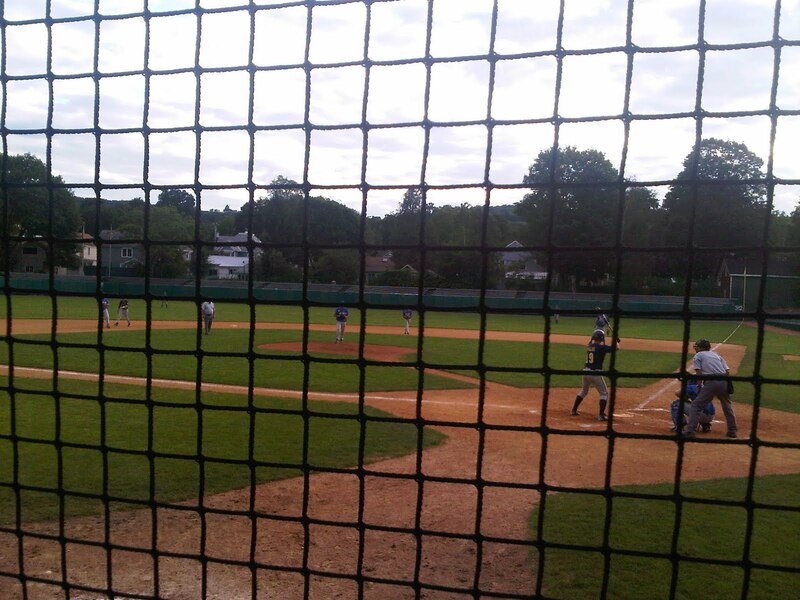 We couldn't tell what level it was, but it appeared to be a Babe Ruth League game (does that still exist?) - maybe 14 to 16 year olds. They didn't look like varsity high-schoolers. 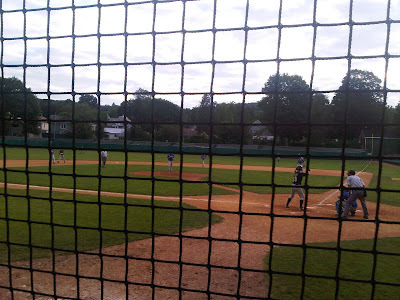 I think this kid made the final out of the game when the ump called strike three on a ball a foot off the plate. Surprisingly, my drunken calls of "Blue, what are you doin'!" didn't change the call. 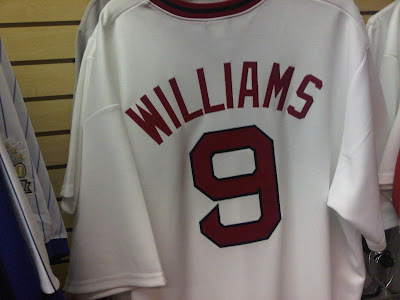 One of the great things about visiting Cooperstown is perusing all the memorabilia shops. They have some incredible stuff in these stores, often juxtaposing old jerseys and other memorabilia of stars of different eras in cool ways. 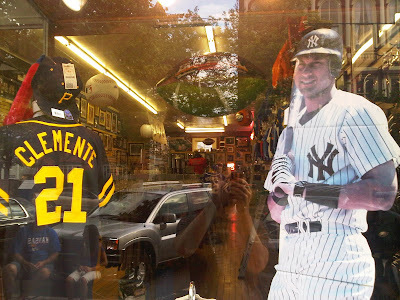 For example, this store window showed off one of the greatest baseball players of all time. And Derek Jeter. Like I said, I love the random groupings of gear from great players that otherwise wouldn't be grouped together. 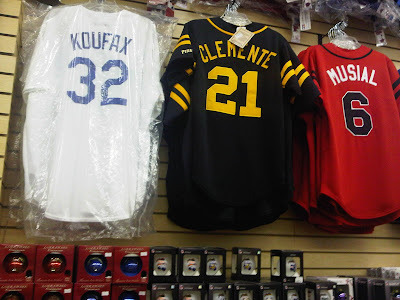 Here you have jerseys for Koufax, Clemente, and Musial, three of my top 5 favorite players of all time, hanging on the wall side-by-side. 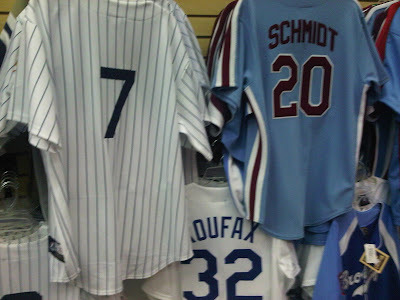 Unless you happened to be touring the locker room of the Ryan's Favorite Player All Stars, I don't know where else you'd see these jerseys hanging together. Except here, in Cooperstown. The first World Series I remember watching was the 1982 Series between the Cardinals and Brewers. 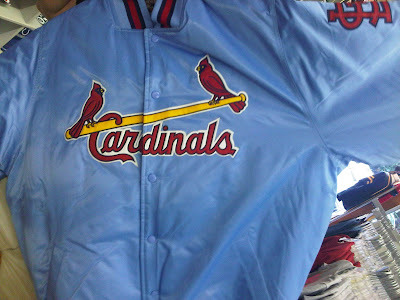 For that reason, even though I'm no fan of either franchise, I've always had a fondness for those two particular teams. 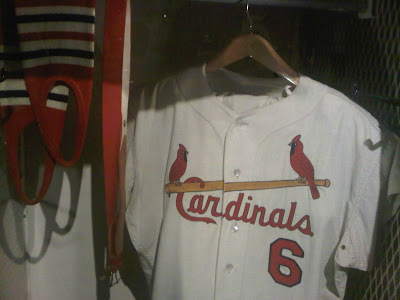 These Cardinal colors worn by the '82 team - a team that featured former Padres Ozzie Smith, Gene Tenace, George Hendrick, and Steve Mura in prominent roles - are colors I'll always associate with early 80s baseball, a great, but often underrated time to grow up and learn about the game. Another choice grouping. What's fun about these groupings, other than just being cool to look at, is that you can imagine these guys playing together. For example, let's say I get Mantle, Koufax, and Schmidt on my team. 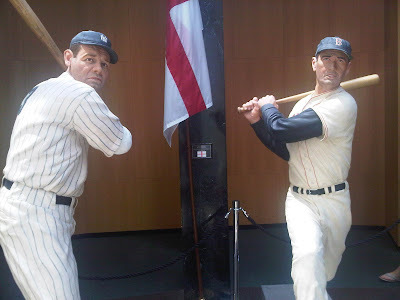 Then I let you go ahead and pick your entire team and you take, oh I don't know, Bench, Gehrig, Morgan, Ozzie, Brooks Robinson, Teddy Ballgame, Mays, and Aaron. And Bob Gibson to pitch. But then I fill out my team with Bill Dickey, Jimmie Foxx, Rogers Hornsby, Robin Yount, Barry Bonds, and Babe Ruth. I don't know who wins that game, but I'd probably buy a ticket to watch it. High comedy. 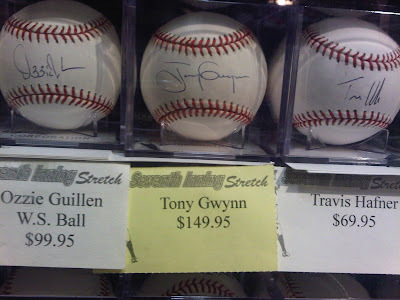 You know I love Tony, but I'm not paying $149 for his signed anything (okay, maybe that's too far; I could see buying a game-worn jersey from the '84 Series or one of his game-used bats maybe). But that's obviously not the funny part. 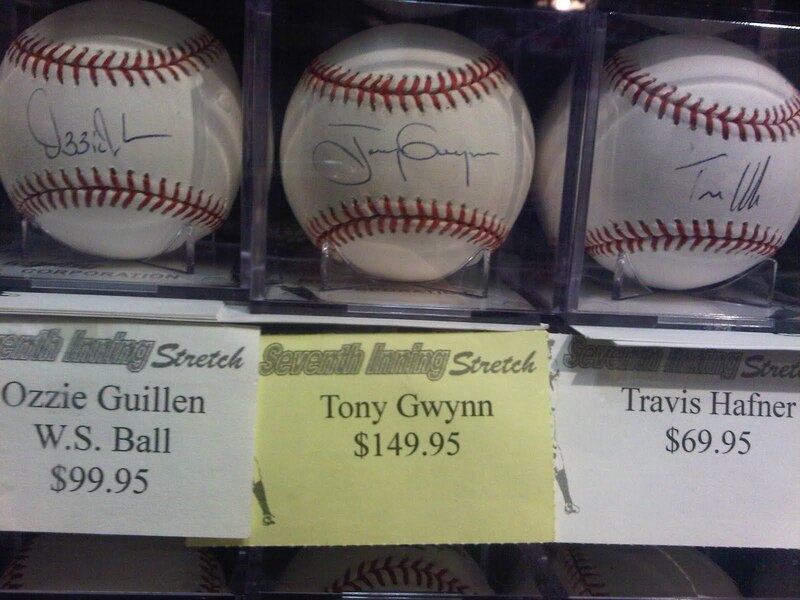 $99.95 for an Ozzie Guillen signature? 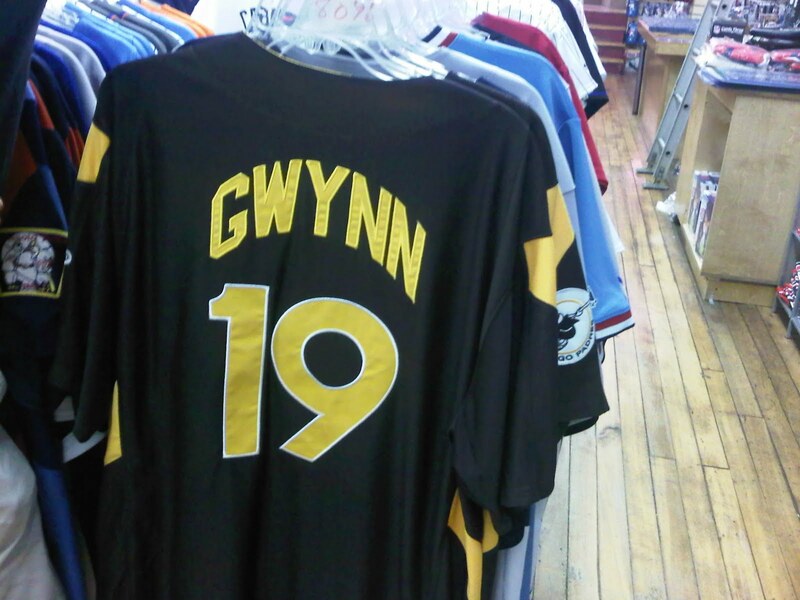 $69.95 for Travis Hafner? I mean you couldn't make this up. 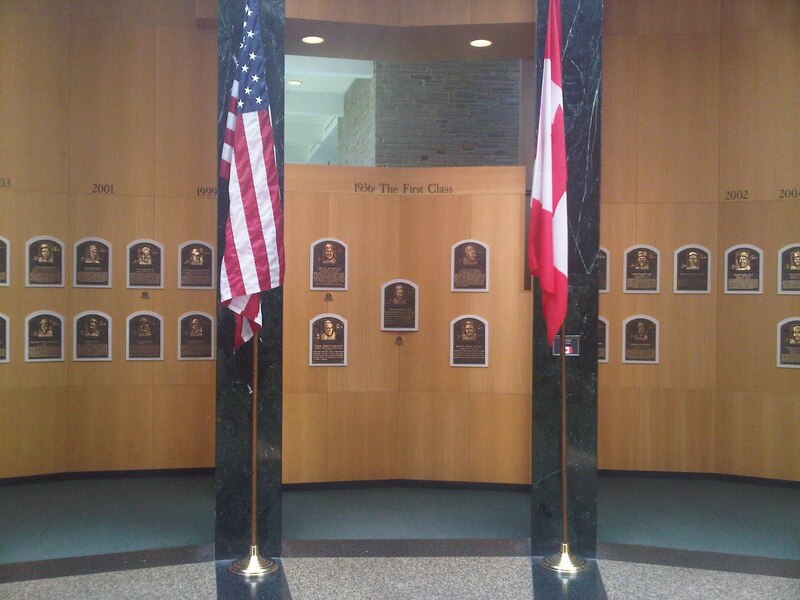 The next day we started early at the Hall of Fame. I didn't take photos of everything; no one could. There's just too much good stuff. 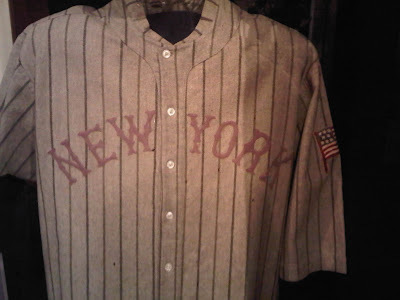 I did take some photos of things that caught my eye, or that had special meaning to me, and it started with this Christy Mathewson jersey. Christy has always been one of my favorite players based on his exploits in the 1905 World Series, and he wore this jersey, if I remember correctly, during a tour of Japan. 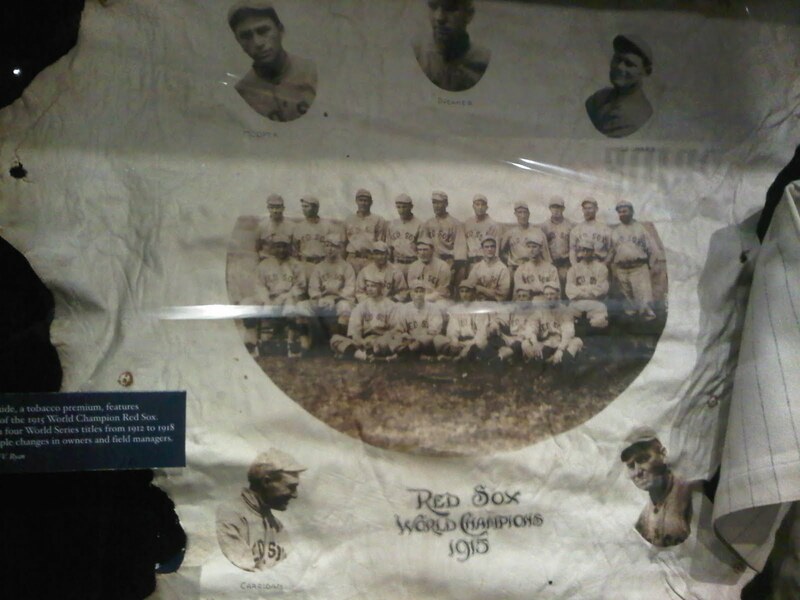 Here's a stretched animal hide commemorating the Red Sox 1915 World Series victory. Why don't teams issue commeorative animal hides anymore? Baseball should really get back to that. 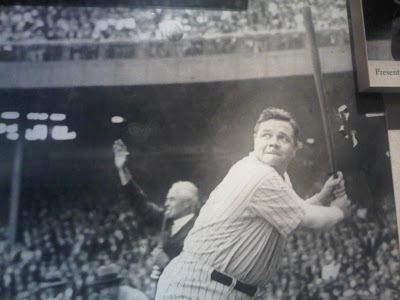 Look at Babe load his swing. If you're like me, even though you've read all the stories and seen all the numbers, you still look at the old Babe footage and wonder sometimes how he could have been as good as he was. But then I see a photo like this and realize it was probably because he had ridiculous hand-eye coordination, a ton of strength, very quick hands through the zone, and perhaps most of all, loaded his swing like a slingshot. I know he's just messing around here, but wasn't he always? Musial's stirrups. Now I can say I saw them. 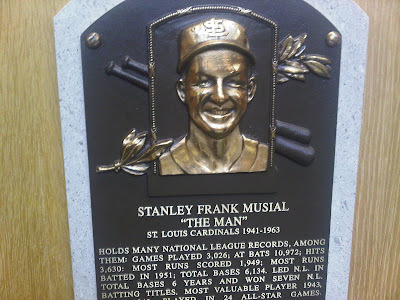 The Hall of Fame celebrates moments as much as it does individual players. 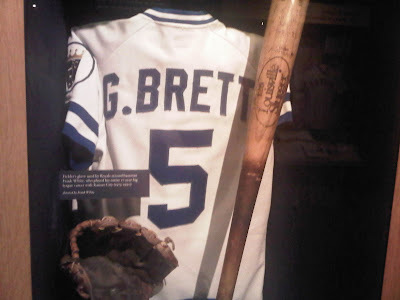 Here you have George Brett's bat from the pine tar incident. I thought the presentation was done well because they included Brett's jersey - the classy Royals blue and white - and his glove, and didn't just make it about the bat. Brett was a monster whose career was memorable for so much more than that one moment. 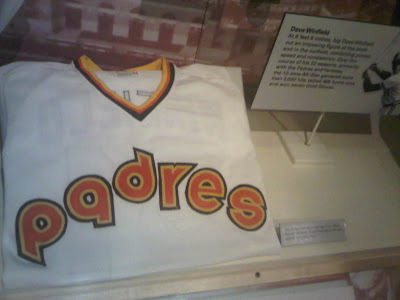 A jersey Dave Winfield wore with the Padres. 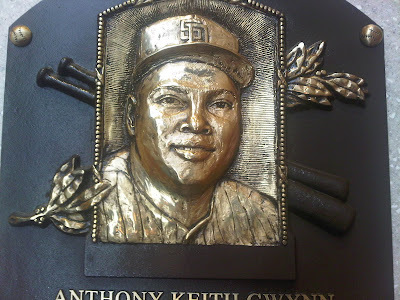 It must have been one of his last seasons in San Diego because I didn't know the Padres had moved to this lettering until after Winfield left town. But more importantly, you should have seen what other items shared space in this glass showcase. There was a Red Sox jersey that Pudge Fisk wore in '76, the bat and ball Jim Rice used to get his 400th total base in '78, the glove Gary Carter wore in his NL record-breaking 1,862nd game behind the plate, Wade Boggs' bat and batting glove from '89, his 7th consecutive year tallying 200+ hits, the bat Cal Ripken used to hit a bomb in the '91 All Star Game, the jersey and helmet Robin Yount wore when he got his 3000th hit, and the hat, glove and ticket stub from Nolan Ryan's 5000th strikeout game. 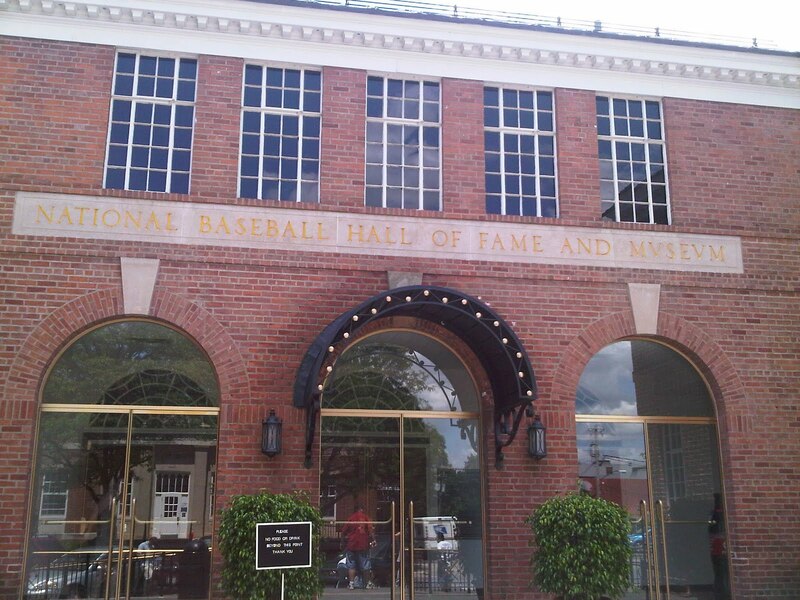 I'm just a humble baseball fan, but I'd say that's one heck of a glass showcase. 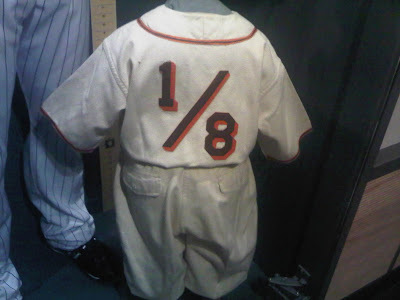 Here is the uniform Eddie Gaedel wore during his famous at bat for Bill Veeck's St. Louis Browns in 1951. I took the photo in honor of Kyle Gaedele, Eddie's grand-nephew, who the Padres had drafted a few weeks earlier. Incidentally, I'm currently reading Bill Veeck's autobiography - Veeck: As In Wreck - and the opening chapter is a solid firsthand account of the events leading up to the Gaedel at bat. I hightly recommend it. After touring the museum upstairs, we went downstairs to the Plaque Gallery. As good as the presentation is upstairs, I still love the plaques the best. You could read these all day long, literally. 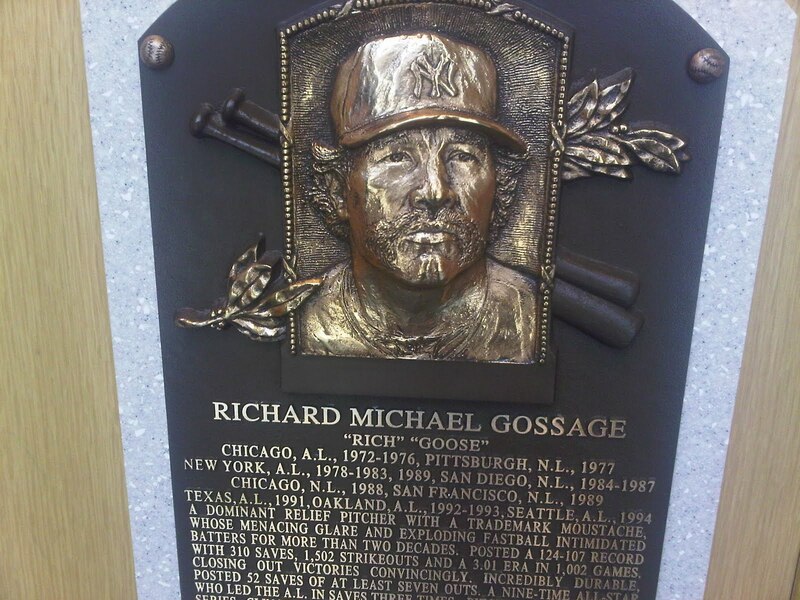 Goose's plaque is great. 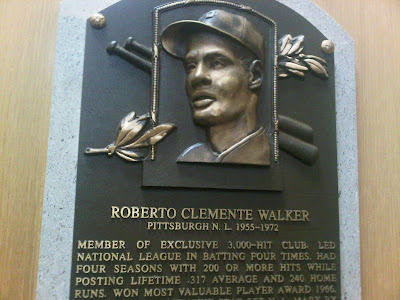 I loved this line: "Incredibly durable, posted 52 saves of at least seven outs." From the vantage point of being a fan in 2011, that's an incredible statistic. "An artisan with a bat ...."
The Artisan in close up. I'd either forgotten or never knew that Clemente led the NL in batting four times, and finished his career with a .317 average. 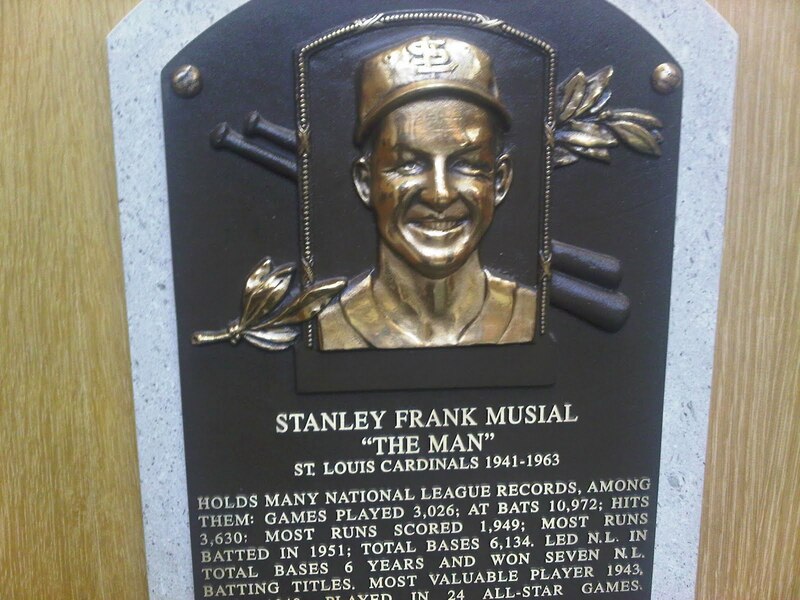 There really was nothing he couldn't do on a ball field. I'd grin like a goofball too if my nickname was "The Man." 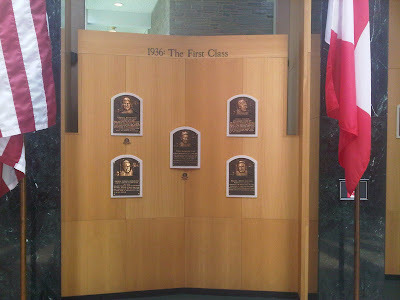 And the end of the hallway housing the Plaque Gallery is a place of honor for the First Five Hall of Fame inductees: Ruth, Mathewson, Wagner, Cobb, and Walter Johnson. It's all very well done. Here's a wide view of the First Five and some of the more recent inductees that surround them. 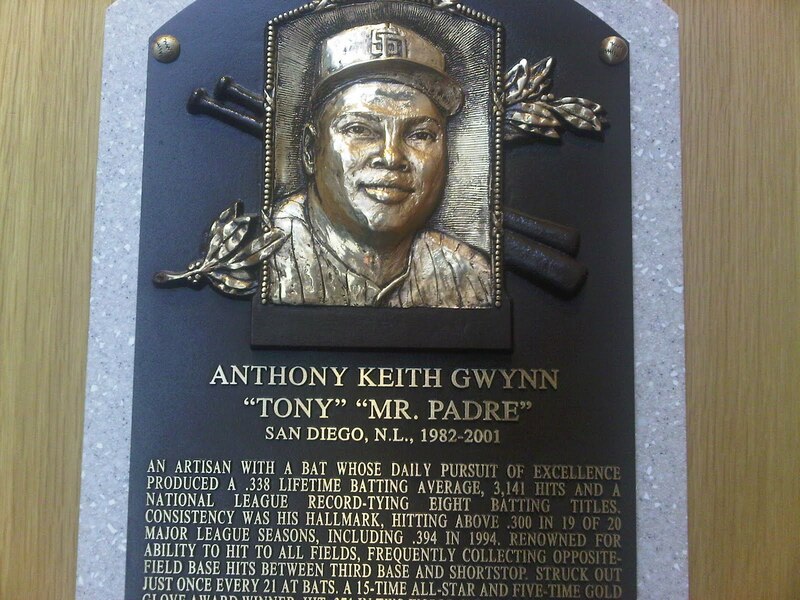 Tony Gwynn's plaque is to the left of the First Five. 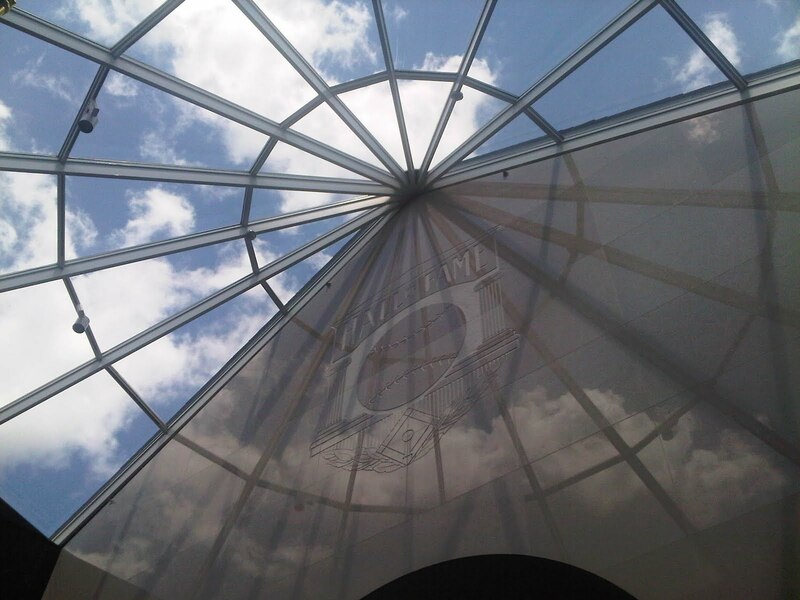 Here's the glass ceiling that lets in sunlight on the First Five and other recent inductees. The sky that day was perfect. Look at how the clouds are reflected in the marble. 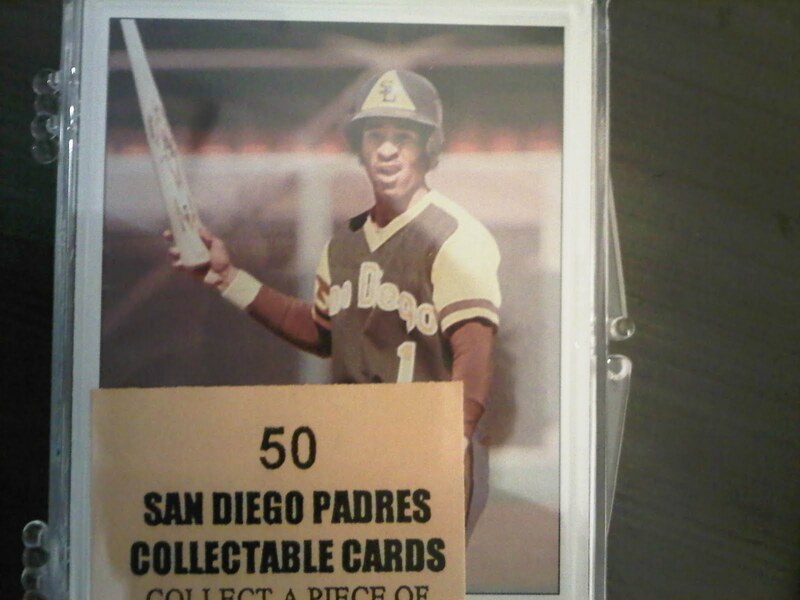 Two lefties that would have no trouble hitting at Petco. This was genius. In the gift shop you have to pass through to leave the Hall they have these sets of 50 random cards for each team. They cost $9.50 each so obviously I purchased a Padres set without even hesitating. 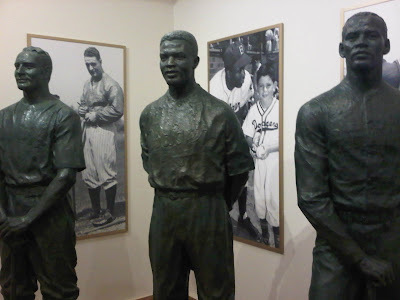 Finally, I couldn't leave the Hall without snapping a photo of these three statues honoring Lou Gehrig, Jackie Robinson, and Roberto Clemente. The statues are placed so they greet you when you enter the Hall, and wish you well on your way out. There probably aren't three better ballplayers they could have chosen for this duty. Again, well done. I don't know why, but sometimes this blog makes me laugh out loud. It's a lot more subtle and clever than it looks at first glance.